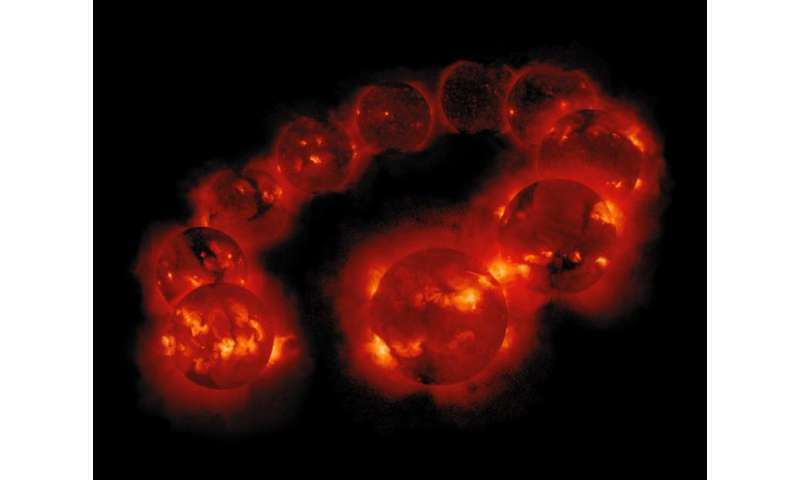 A new model of the Sun's solar cycle is producing unprecedentedly accurate predictions of irregularities within the Sun's 11-year heartbeat. The model draws on dynamo effects in two layers of the Sun, one close to the surface and one deep within its convection zone. Predictions from the model suggest that solar activity will fall by 60 per cent during the 2030s to conditions last seen during the 'mini ice age' that began in 1645. Results will be presented today by Prof Valentina Zharkova at the National Astronomy Meeting in Llandudno. Zharkova and her colleagues derived their model using a technique called 'principal component analysis' of the magnetic field observations from the Wilcox Solar Observatory in California. They examined three solar cycles-worth of magnetic field activity, covering the period from 1976-2008. In addition, they compared their predictions to average sunspot numbers, another strong marker of solar activity. All the predictions and observations were closely matched. Get ready for the freezing, pre-industrial temperatures, the AGW Cult wants so much. To be clear, we did not have to speculate about an unseen dynamo inside of the Sun in order to predict that temperatures will drop in the coming decades. We know this based upon sunspot correlations, which of course correlate with the Sun's magnetic activity. What would be interesting -- now that scientists increasingly recognize that the galactic spiral arms exhibit electric currents -- is to also create a model which attributes the Sun's magnetic cycles to changes in these large-scale electric currents. But 1% is all ALL the planets contribute. Could that little even lined up in a row influence Sol? What if this second resonance deep inside Sol--conjectured only---is the result of an instability between hemispheres? If it is, then possibly this second resonance could be building to be the core of a neutron star anticipating the nova of Sol? That sounds crazy even to me. None of the reports I have seen on this has stated what exactly is meant by "solar activity". Sun spots? I doubt it is a 60% reduction in energy output. The study authors made a presentation but haven't published it in a peer review journal as of yet. Until that happens I'm going to remain skeptical, as I am whenever a pr release precedes the actual paper. Lots of other links too. IMO the solar radiance is relatively stable, it's influence to climate is indirect through emissions of solar wind particles, which are expanding the atmosphere and initiate the nucleation of vapors in atmosphere, by their charge etc. Well Stumpy, how long have I been saying this now? The only difference this time is we have accumulated much more heat in the oceans, and our GHG concentration is higher. Perhaps this will keep it from not being as brutally cold as the last "little ice age". So phys.org finally saw fit to actually post an article about this (days after other news orgs did)... odd that there was no headline about the potential effect on the climate. Why would that be? The only difference this time is we have accumulated much more heat in the oceans, and our GHG concentration is higher. Perhaps this will keep it from not being as brutally cold as the last "little ice age". From Wiki: The eruption caused global climate anomalies that included the phenomenon known as "volcanic winter": 1816 became known as the "Year Without a Summer" because of the effect on North American and European weather. Crops failed and livestock died in much of the Northern Hemisphere, resulting in the worst famine of the 19th century. Critiques of this announcement are beginning to roll in. It is going to an interesting debate. Actually, we know very well that we won't have another little ice age since the loss of energy due to another Maunder Minimum is less than the gain in energy due to the excess levels CO2. Well Stumpy, how long have I been saying this now? The lead author seems to be something of a crackpot (she claimed that Mars is warming - http://blog.hotwh...tml#more ). So it might be good to wait until there have been real reviews of this paper. So far, this has just been presented at a conference, so has little or no review. Another critique of the announcement points out the" little ice age" began well before the Maunder Minimum and continued after it ended. RC, volcanism as the cause is just as speculative as the solar cycle. Plus the timelines don't sync up as well for the LIA/major volcanic eruptions as it does with the MM. Stumpy, I realize that this is by no means an accepted theory, but it is evidence that my claims (based on Landscheidt's work) are at least plausible. The good news, we won't have to wait much more than a few years for it to be validated. Vietvet, as for the LIA/MM timing it's not just as simple as less sunspots = colder Earth. The solar cycles force the ocean's oscillations (PDO/ENSO/NAO etc..). So while the Sun can drastically change every 11 or so years, the oceans take longer to normalize into their new states. "On May 19th of 2004 Theodor Landscheidt, one of the most scientific contributors to the field of astrology in the 20th century, died. He was known, though not necessarily understood, for his occasional journal articles and presentations at conferences, mostly in the 1960's and 70's. " " In the May-June, 1998 issue (Vol 40, #3) of the Astrological Journal (published by the Astrological Association of England) Theodor Landscheidt presents several findings regarding the distribution of planets in birth charts of famous people. One of his findings is that the angular distance of Mars and Saturn in the birth charst of 16,800 scientists and physicians is more often in a golden ratio aspect than would be expected by chance." How can you trust anything from a f'ing astrologer? BTW using this theory I predicted back in November that we would be heading for a strong El Nino based on the PDO regime shift, a prediction that is now being realized, and one that runrig laughed at. "The next [PDO]regime shift from cold to warm is to be expected around 2016.3, the midpoint between GPTC 2007.2 and LPTC 2025.4.... Once the PDO regime switches to "warm" again the drought stricken southwest will start to receive above average rainfall amounts." I can trust it because the data and predictions back the theory. I don't let dogma influence my views of science. Astrology is more than dogma, it's pseudoscience of the worst kind. Stumpy, what in his research is based in astrology? These rants are just ridiculous and off topic. Also, weren't you ever told to not judge a book by it's cover? BTW are you eating people now? what in his research is based in astrology?...not judge a book by it's cover?... eating people now? why waste time on pseudoscience? Lol no worries, just thought I get one in on ya when I could. As for Landscheidt's astrological connections, it matters not with regards to his theories on solar forcing of the climate. None of his theory says anything about 'Jupiter in the 3rd house blah blah blah makes the climate cold', so can we just agree to disagree about his reputation? The point I was trying to bring up is there is more validity in solar forcing than AGW either wants to believe or accounts for. It's nice to see a paper that is trying to find the missing link. a "reputation" only affects my reading schedule- when i get to a study when things are backed up and i am busy. no named people in quotes (why? libel or litigation?) and references to farmers almanac, and... you guessed it... NOT ONE SINGLE CALL OUT TO A STUDY OR PRIMARY SOURCE! What about cardiovascular deaths or traffic accidents? what is it you are specifically trying to say? I'm here only for the people, who just want to educate yourself. just because you believe in something doesn't make it true, real, or science... this is obvious in your acceptance of just about ANY source as well as your acceptance of pseudoscience over refuting evidence. in case you didn't catch the implication above: you are what is called "scientifically illiterate" and you post about a failed & debunked belief. that makes you a CULT leader, not "here only for the people, who just want to educate yourself"
RC, I was only stating that the cause of the LIA being volcanism is speculative. Not that "volcanic winters" are, we know that is a real thing. Thanks for acknowledging my point per se. As for 'speculative', the following should give you an indication that there is nothing speculative with the recorded history of the known volcanoes that contributed ash/sulfur etc to ongoing 'volcanic winters' which 'ran into each other' because the individual effects did not subside before the next one came along to continue/intensify the effects locally/globally during those terrible centuries of ash and acid rains. Wiki: Vesuvius entered a new phase in December 1631.....activity thereafter became almost continuous, with relatively severe eruptions occurring in 1660, 1682, 1694, 1698, 1707, 1737, 1760, 1767, 1779, 1794, 1822, 1834, 1839, 1850, 1855, 1861, 1868, 1872, 1906, 1926, 1929, and 1944. ...followed by three smaller eruptions in 1268, 1275, and 1284 that did not allow the climate to recover, may have caused the initial cooling, and that the 1452–53 eruption of Kuwae in Vanuatu triggered a second pulse of cooling. The cold summers can be maintained by sea-ice/ocean feedbacks long after volcanic aerosols are removed. Other volcanoes that erupted during the era and may have contributed to the cooling include Billy Mitchell (ca. 1580), Huaynaputina (1600), Mount Parker (1641), Long Island (Papua New Guinea) (ca. 1660), and Laki (1783). The 1815 eruption of Tambora in Indonesia blanketed the atmosphere with ash; the following year, 1816, came to be known as the Year Without a Summer, when frost and snow were reported in June and July in both New England and Northern Europe. and it's far from 'speculative'. Yes? I'm not saying it isn't the cause, but as we don't truly know what happened by definition it's still speculative. i tell you, a functional cold fusion reactor/generator that is proven in the world and the corresponding Nobel will definitely make me subscribe to your page and re-think your posts.. let me tell you!